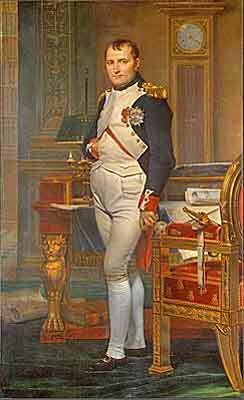 French Emperor and codifier of French civil law. Born in 1769. At birth on the Island of Corsica, his name was Napoleone di Buonaparte but he changed it, later, to the more French-sounding Napoleon Bonaparte. It had been centuries since European rulers had recognized the value to the state of written, unified law. Indeed, it suited the monarchists of the epoch to consider law as did Louis XVI: "je suis la loi" (I am the law). But Napoleon changed all that. By 1799, Napoleon ruled France and proposed a constitution which was widely endorsed by the French populace in a referendum taken in February 1800. Napoleon reformed the French post-revolution justice system, appointing rather then electing judges and promoting their credibility and independence by making their tenure permanent. He also implemented a then-revolutionary measuring system, now known as the Metric system. The other big reform was the publication of a Civil Code of French law, which became law on March 21, 1804. Work on the Code had actually been underway for 14 years but his trusted legal lieutenant Jean-Etienne Portalis was up to the task. In 1804, the Code was published and was quickly dubbed the Code Napoléon. A harbinger of civil law then and now, the drafters of the Civil Code insisted that the wording be simple and readily understandable by the citizens of the state, and not just lawyers or the well-educated. It has been called one of the most influential documents in the history of the world. "The law applies throughout the territory of France." The Code Civil built upon a strong Roman law foundation already in place in the various regions of France. "My code is the sheet anchor which will save France. And it will entitle me to the benedictions of posterity." The Code brought into one comprehensive national legal code most of the gains of the Revolution such as equality before the law, individual liberty and freedoms and the lay character of the government. Besides France, the Code became the model for French colonial legal systems including Louisiana and Quebec. Napoloen followed the Civil Code with a lesser-known companion document, a Code de procedure civile which was published in 1806. Four years later, he completed his ambitious legislative agenda by publishing a Code criminel. Since Napoleon, who died in 1821, all states place legislative development on the highest pedestal of government activity.